WHAT:	More than 400 youth ages 14 to 24 spent their summer learning how to find and keep a summer job, despite barriers such as being a foster youth, a teen parent, incarcerated or having a disability. Now the Boys & Girls Club will salute them. The Summer Jobs for Youth Program is a partnership between the Boys & Girls Clubs of Greater Oxnard and Port Hueneme, the Ventura County Office of Education and Oxnard City Corps. The youth participated in an eight-hour training course to learn work readiness, teamwork and leadership skills. They were then matched to a work site to learn workplace skills and habits, while earning money for the summer. The Summer Jobs for Youth Program operates along with policies set by the American Recovery and Reinvestment Act and the County of Ventura Workforce Administration. The program was put in place to motivate and give local youth an opportunity to work and achieve an employment goal, working together for the benefit of the community. 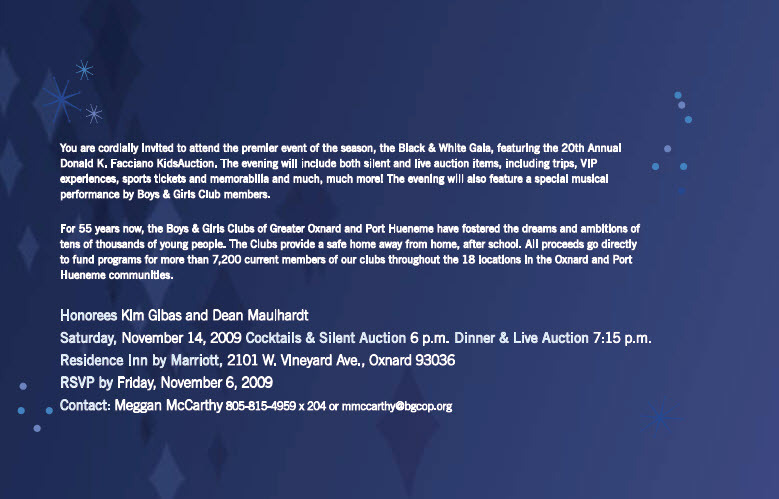 On Saturday, November 14th, the Boys & Girls Clubs of Greater Oxnard and Port Hueneme will host the 20th Annual Kids Auction at the Residence Inn by Marriott Hotel in Oxnard. The black tie event is the organization’s largest special event fundraiser and hopes to raise over $200,000 that evening. 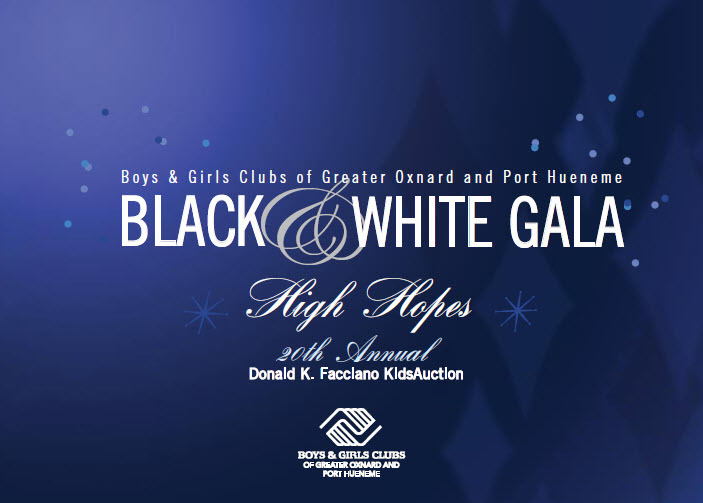 Proceeds from the Black and White Gala themed event will support the 18 Boys & Girls Clubs sites within Oxnard and Port Hueneme and more than 7,200 youth that they serve annually. 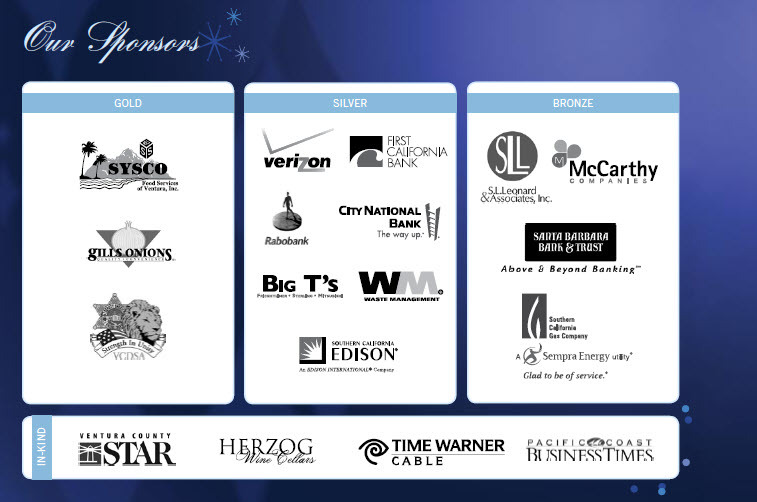 The evening will start off at 6 p.m. with a silent auction before the dinner and live auction portion of the evening. The BGCOP and Rio School District’s “Voices of Hope Choir” will also perform at the event. Guests will have the opportunity to bid on unique vacations, tours and other opportunities, men’s and women’s items. The Club is seeking sponsors, auction donors, attendees and volunteers for the evening. Please contact Meggan McCarthy (805) 815-4959 ext. 204 or mmccarthy@bgcop.org for more information. Kaiser Permanente & Community Memorial Hospital announce the fourth annual Boys & Girls Club’s “Day for Kids,” Sept. 12 in Oxnard. The mission of the club’s “Day for Kids” is to build stronger relationships between positive adults and kids by educating them on the importance of spending meaningful time together. The special annual event engages adults, families and youth via local community celebrations, special promotions, public awareness campaigns, educational resources and other opportunities to encourage positive, sustaining relationships. Boys & Girls Clubs of America envisions a nationally-recognized day for young people that will create an extraordinary platform for youth, and establish a lasting tradition to reinforce the need of all children for a positive and caring adult in their lives. 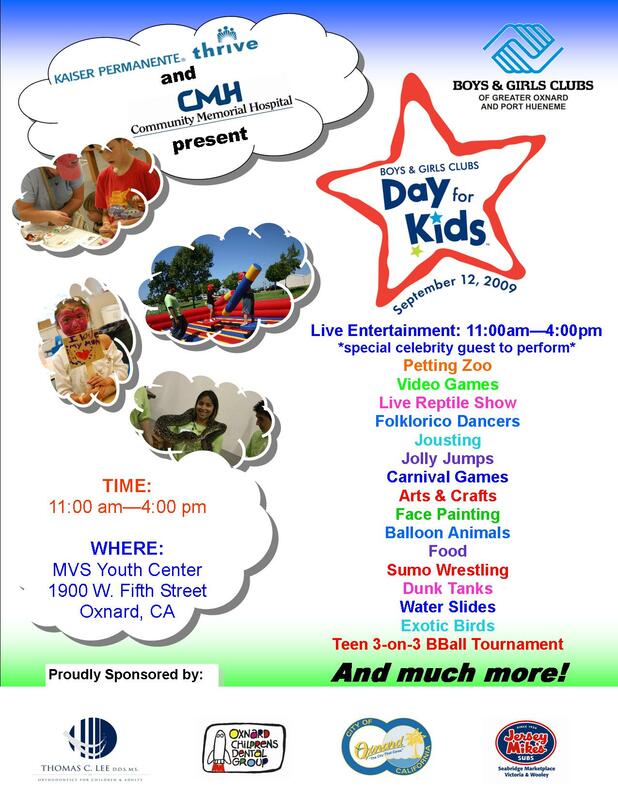 To that end, they have deemed the second Saturday of September the official “Day for Kids.” The event is set for 11 a.m. – 4 p.m. at the Martin V. Smith Youth Center, 1900 West 5th Street, Oxnard. Thanks to our generous sponsors including Oxnard Children’s Dental, Jersey Mike’s, and Dr. Lee, the Boys & Girls Clubs of Greater Oxnard and Port Hueneme’s “Day for Kids” celebration is a great fun-filled, no-cost way for families and children to spend quality time together. The event will feature Sprinkles the Clown, a petting zoo, reptile and bird shows, arts & crafts, jumpers, a dunk tank, outdoor activities including jousting and sumo wrestling, entertainment, games and free face painting. Kaiser Permanente is America’s leading integrated health plan. Founded in 1945, the program is headquartered in Oakland, Calif. Kaiser Permanente serves 8.7 million members in nine states and the District of Columbia. Today it encompasses Kaiser Foundation Health Plan, Inc., Kaiser Foundation Hospitals and their subsidiaries, and the Permanente Medical Groups. Nationwide, Kaiser Permanente includes approximately 164,000 technical, administrative and clerical employees and caregivers, and 14,000 physicians representing all specialties. The organization’s Labor Management Partnership is the largest health care partnership in the United States. It governs how more than 130,000 workers, managers, physicians and dentists work together to make Kaiser Permanente the best place to receive care, and the best place to work. What originated in 1901 as a single hospital serving its neighbors, Community Memorial Hospital has today grown into an expansive healthcare system that touches the lives of individuals throughout Ventura County, California and beyond. Community Memorial Health System, established in 2005 when Community Memorial Hospital in Ventura merged with Ojai Valley Community Hospital, is comprised of these two hospitals along with nine family-practice health centers serving various communities within Ventura County. Boys & Girls Clubs of Greater Oxnard and Port Hueneme (http://www.positiveplace4kids.org) comprises 18 neighborhood-based facilities serving 7,200 youth annually through Club membership and community outreach. Known as “The Positive Place for Kids,” the Clubs provide guidance-oriented character development programs on a daily basis for children 6-18 years old, conducted by a full-time professional staff. Key Boys & Girls Club programs emphasize leadership development, education and career exploration, financial literacy, health and life skills, the arts, sports, fitness and recreation, and family outreach.